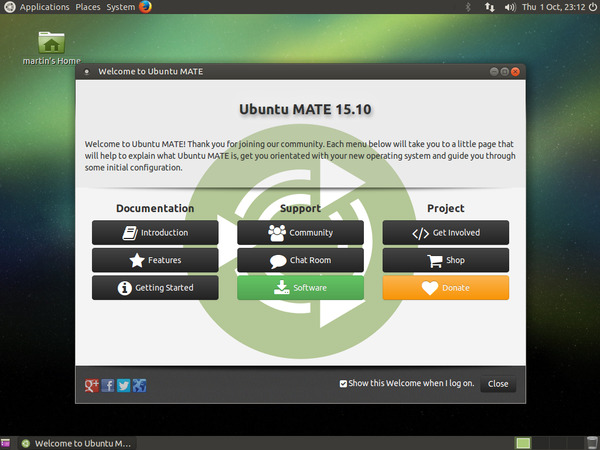 Raspberry Pi linux Ubuntu Mate Ubuntu Mate is a Linux distribution that uses the Ubuntu distribution as a framework. "Mate" stands for the Mate desktop, which places only small demands on the CPU and the graphics-processing system. Ubuntu Mate is a Linux distribution that uses the Ubuntu distribution as a framework. "Mate" stands for the Mate desktop, which places only small demands on the CPU and the graphics-processing system. The Mate desktop is based on the Gnome 2 desktop. It looks the same and works almost as it is known from other Linux distributions with Gnome 2. Of course, with the well-known quirks. Compared to Raspbian, Ubuntu Mate is not fully set up on first boot. The first time you boot, a system configuration wizard starts, similar to fresh installations. The language, country settings and keyboard layout must be set. Not to forget username and password. There is no predefined user. It's important to know that Ubuntu Mate has some limitations compared to Raspbian. The disadvantage of the Ubuntu kernel is that, for security reasons, it prevents Python from accessing the GPIOs via RPi.GPIO. Here you would have to replace the kernel (compile yourself) or you use the WiringPi library. If you want to use Raspberry Pi (2 B) as a desktop mini PC without the Raspbian features, then Ubuntu Mate is a good choice. Which operating system for Raspberry Pi? Who has the choice, Which operating system or Linux distribution should one use? That is the question. The answer, it depends. Below is a recommendation.